June 18, 2015 12:04 pm By Lori Post contains sponsored/affiliate links and I get commissions for purchases made from links. As an Amazon Associate I earn from qualifying purchases. Head in to your local Old Navy store to get $1 flip flops this Saturday (6/20). This is a very popular sale, so be prepared to fight the crowds! There is a limit of 5 pair per customer. In past years, the selection was quite limited by noon. Call your local store for hours, as they may open early for this sale. EXPIRED: Old Navy Adult Sneakers $10 Today! May 28, 2014 1:15 am By Lori Post contains sponsored/affiliate links and I get commissions for purchases made from links. As an Amazon Associate I earn from qualifying purchases. Head in to Old Navy today for a smokin’ hot deal! Adult Sneakers are on sale for just $10 while they last! Available in a variety of colors. March 19, 2014 8:29 am By Lori Post contains sponsored/affiliate links and I get commissions for purchases made from links. As an Amazon Associate I earn from qualifying purchases. Visit Old Navy today only (3/19) to get Women’s Rockstar Military Pants for $10 a pair. In zip pocket and cargo style. Regular price is $34.94. August 10, 2011 9:39 am By Lori Post contains sponsored/affiliate links and I get commissions for purchases made from links. As an Amazon Associate I earn from qualifying purchases. This evening (8/10) from 6-9pm, Aerie stores are having a Drew Launch Party where they’ll be giving away tote bags to the first 100 customers and free Drew bras to the first 10 shoppers who check in with Foursquare. Details HERE. The Gap: 10,000 Free Pairs of Jeans! November 4, 2010 7:00 am By Lori Post contains sponsored/affiliate links and I get commissions for purchases made from links. As an Amazon Associate I earn from qualifying purchases. Tomorrow (11/5) the first 10,000 shoppers who visit The Gap will get a free pair of jeans! Just use Facebook Places and check in with any employee! If you’re not one of the first, you’ll still get a coupon good for 40% off any regular priced item. Details are HERE. June 11, 2010 9:56 am By Lori Post contains sponsored/affiliate links and I get commissions for purchases made from links. As an Amazon Associate I earn from qualifying purchases. Stop by your nearest Limited store where they are giving out $10 in FREE fashion cash! No coupon required! Use it to buy an accessory item for free or nearly free. February 11, 2010 8:15 am By Lori Post contains sponsored/affiliate links and I get commissions for purchases made from links. As an Amazon Associate I earn from qualifying purchases. 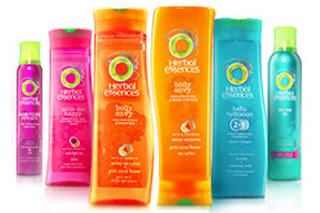 In the 2/7 PG insert there is a coupon for an Herbal Essences Styling Product FREE when you buy any Herbal Essences hair care product. Use this coupon at Target or Walmart to get the travel size shampoo and get a full size styling product free! Final cost for both should be around $.97!